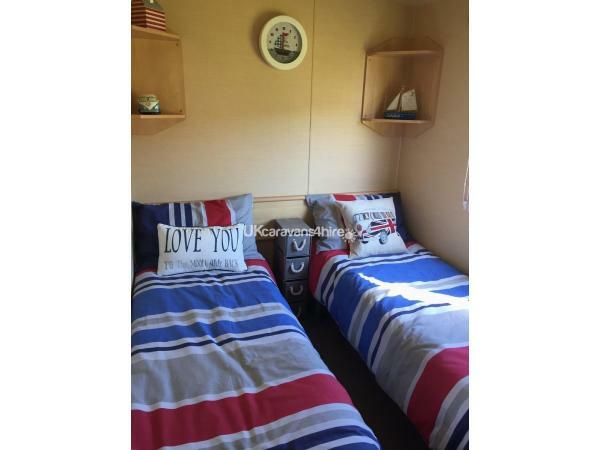 This family owned caravan is our "home from home". It is modern, spacious and very well equipped for a comfortable and relaxing stay. 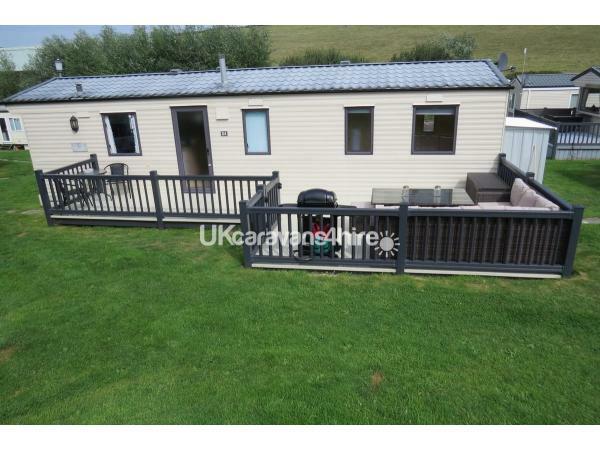 It is situated on the Peter Bull Resorts chain of caravan sites. 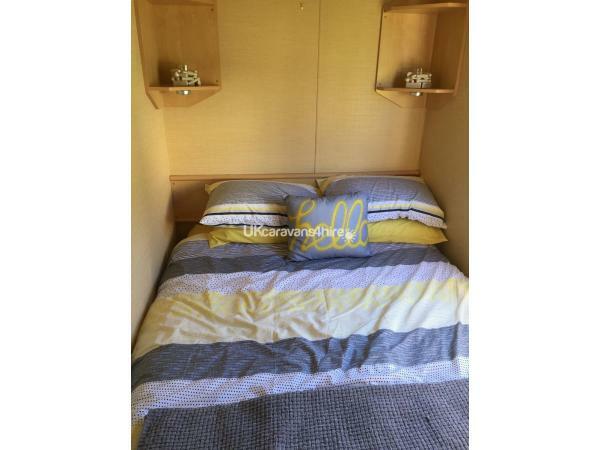 The main bedroom has a double bed with a large wardrobe. The second bedroom also has a double bed and the third has twin beds. Both rooms have wardrobes. There is a main bathroom that incorporates a shower, sink and toilet and also a separate W.C., ideal for the needs of a busy family! Kitchen has oven, grill and hob with microwave and fridge freezer. 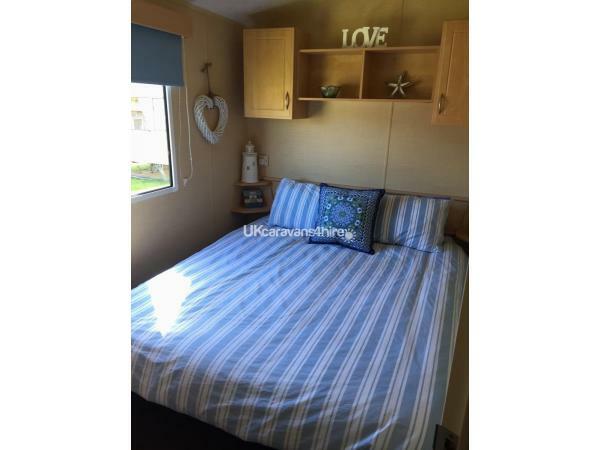 There is also a toaster, slow cooker and well equipped crockery and utensils. There is a dining area with table and seating for 6 adults. The living room has a 42" television with freeview television and a DVD player. 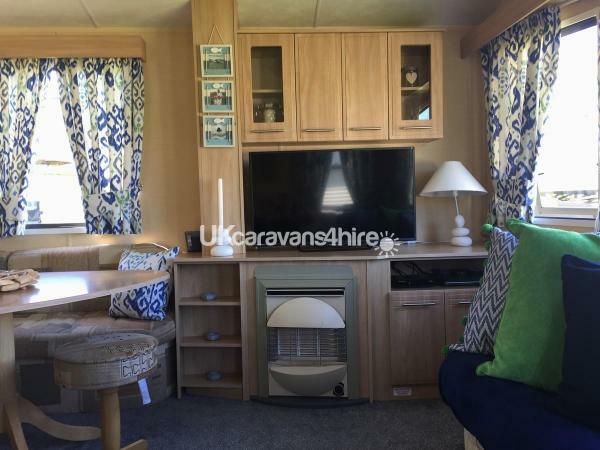 This benefits from a large L shape sofa, that also includes a pull out bed if required. 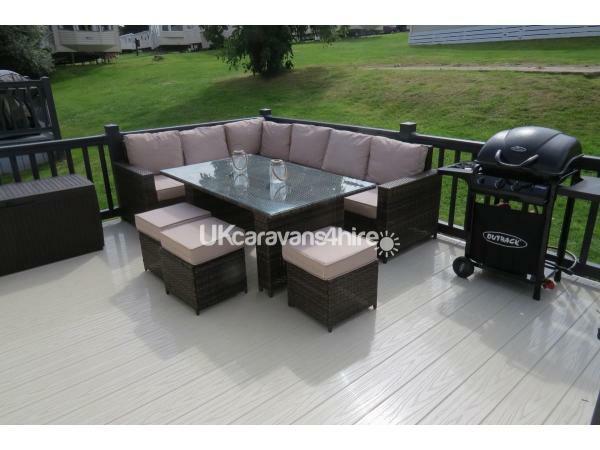 Outside is a brand new, large decking area. This offers a large dining table with L shape rattan sofa and 3 stools, perfect for a sizeable family get-together. There is also a small table with two chairs to enjoy a quiet mug of coffee. 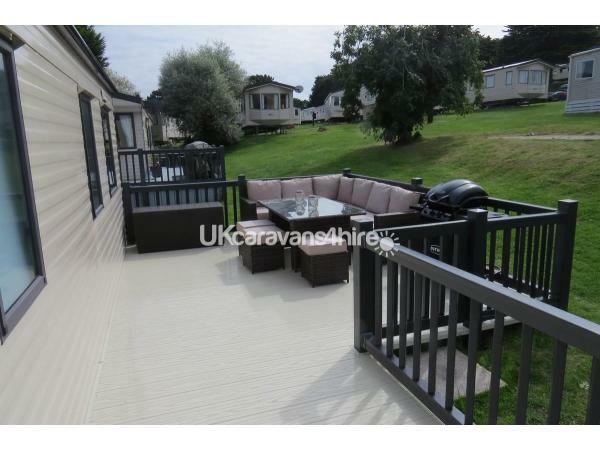 There is a gas barbecue on the deck that guests are welcome to use. There are also 2 sun beds. The van also has a rotary washing line and a iron/ small ironing board. Heating is provided by a gas fire in the living room and electric heater for bedroom areas. We will provide hand towels, tea towels, cleaning products etc, however we politely request that guests provide their own beach towels and bath towels. Is family focused, and has a very large club area which offers entertainment (depending on season), and facilities such as pool tables, ping-pong table etc. 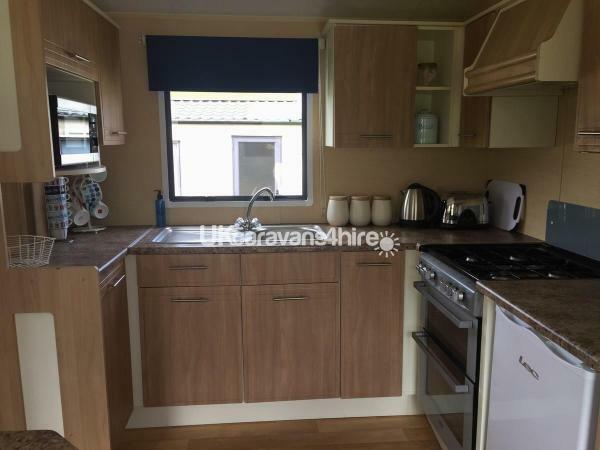 There is a launderette with industrial sized washers and dryers, and a well stocked and reasonably priced Londis shop, both of which are very close to the caravan. 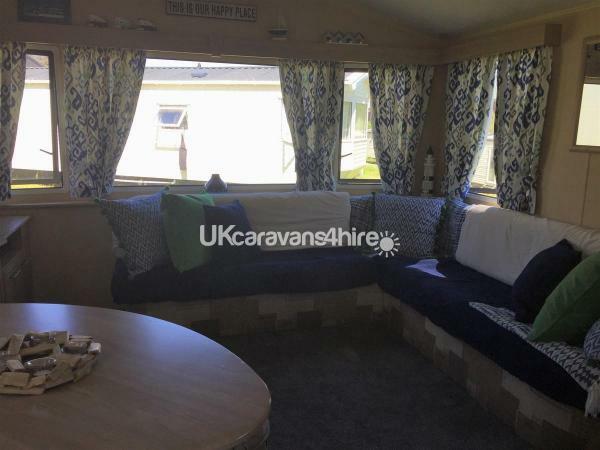 Other facilities on site are a surf school and beauty salon which includes hairdressing and nails, although use of these will not be included in the caravan fee. 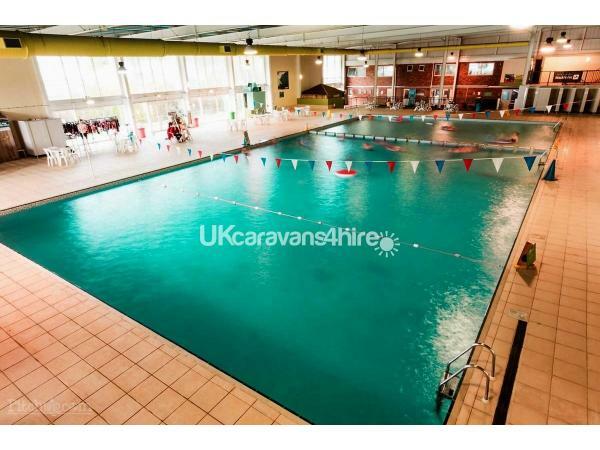 The site has a large indoor swimming pool, with steam room and sauna attached. There is a cafe in this area in which to relax if the children are busy swimming! The Porth Venue clubhouse has a restaurant area and bar which shows football etc for the adults, and has an arcade area for the children. There is also an outdoor pool, with sunbeds provided, perfect for a lazy afternoon. We are dog owners and welcome well behaved pets. On site there is a "doggy shower" and dog walking field, and many of the nearby beaches such as Watergate Bay are dog friendly. 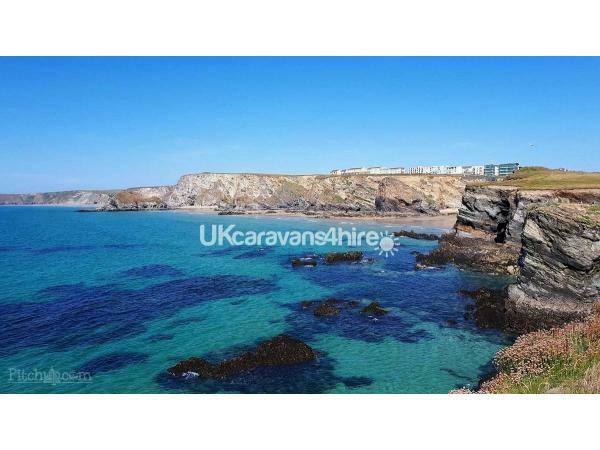 Is fantastic for exploring the fabulous North coast of Cornwall. Newquay is just 5 minutes drive away, whilst a little further down the coast are the likes of Padstow, Wadebridge, Perranporth amongst others. The nearest beach is Porth, which is around a 2 minute drive (or 15 minutes walk for the more active! ), and which boasts the Mermaid Inn that is right on the beach. Close by is Watergate Bay, at around 5 minutes drive, known for its surfing and water sports and massive expanse of beach, and a collection of cafes/ places to eat including Jamie Oliver's Fifteen, Wax, Watergate Bay Hotel and The Beach Hut. Other beaches close by include Treyarnon Bay, Constantine Bay, Harlyn Bay and the home of U.K. surfing at Fistral Beach, Newquay. Being so close to Newquay gives access to the town itself, numerous supermarkets and a cinema, and the host of attractions for which Newquay is known. i.e Newquay Zoo, Blue Reef Aquarium and a lively night scene. A little further afield is the Eden Project, Retallick Resort and with a modest drive towns such as St. Ives. The location is just perfect for those who love being near the sea and taking spectacular walks or enjoying watersports! 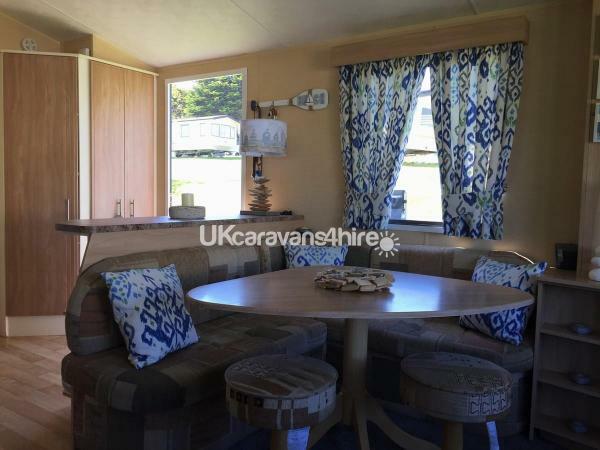 As a local family we have friends with caravans on the site also, and so if you are a larger group/ several families, please call and we can discuss. No reviews found. If you have recently stayed in this holiday home please leave a review, it only takes a few moments and will really help future guests when they are searching for holiday accommodation at Newquay View Resort.